I started in the SCA in college. I have played in the SCA for over 25 years. I have played in several different Kingdoms and to varying degrees of participation. In the year 2000 I moved down to Atlantia and got married. I have been here for 14 years, been a landed Baroness and begun a family. We have two boys, 2 years 9 month apart. 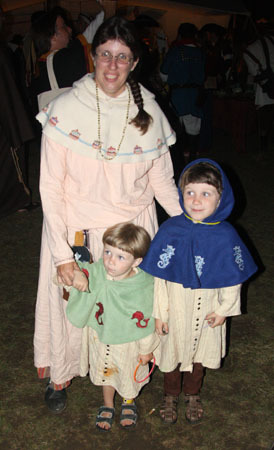 My children have been raised in the SCA. We have had to adjust how we play in the SCA, so our family can be involved. It is hard to be parent and an SCA parent is just as difficult. Hopefully the next few pages will make your journey a bit easier.